By the time I lived in community with Phil Berrigan, he was a wise old man. He had served many years in U.S. prisons for his nonviolent resistance to the Vietnam War and nuclear weapons – initiating the draft board raids and plowshares movements. After I moved on, he would serve many more years. He was in the very best sense disillusioned with popular American pretensions. He suffered from few illusions. Phil had a great saying when it came to the abandonment by liberals and church folks when one moved from rhetoric and pontification into serious nonviolent resistance to the warmaking imperial state. Phil’s wry observation was “Warm friends, cooling!” And so it has gone with Julian Assange and WikiLeaks, most evidently with former enthusiastic collaborators the New York Times and the Guardian newspapers who have been busy putting as much water as possible between themselves and Assange after publishing the WikiLeaks circulated Iraq and Afghan war logs. Here in England, the Guardian – the Pravda of the liberal left – runs a consistent campaign of character assassination of Manning and Assange. “Julian Assange BAD, Bradley Manning MAD” is the line they consistently push. The line filters down to everyone from the authoritarian left factions running the mainstream anti-war groups to the libertarian left who’ve decided to sit this one out. 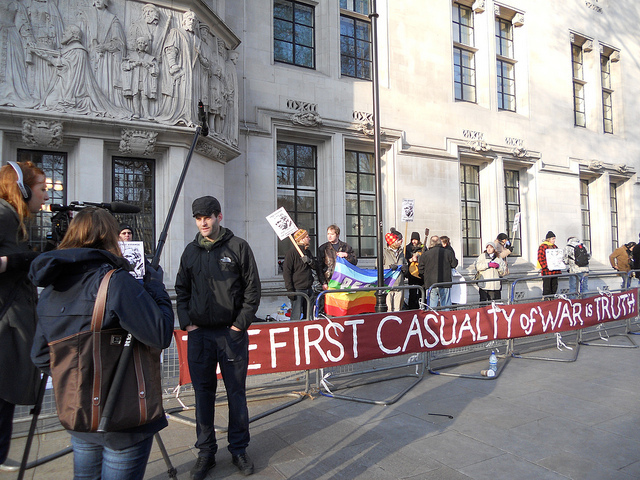 The biggest show trials of of the anti-Iraq War movement are underway in the U.S. and U.K., yet few of the millions who marched against these wars in 2003 gather at court in solidarity with these resisters. 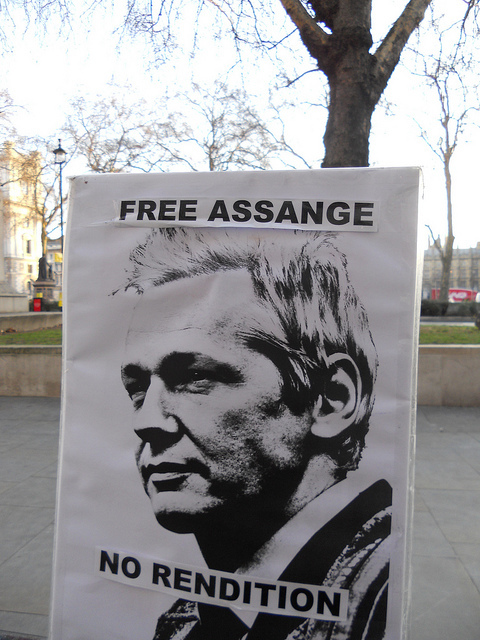 The WikiLeaks Grand Jury continues to sit for now over 500 days in Virginia, USA. The British, Swedish and Australian authorities do all they can to service the U.S. war effort and its repression of those who seriously oppose the wars. This past week, as Bradley Manning remains in chains, in contrast a U.S. marine sergeant gets a no jail time plea bargain for the murder of 15 unarmed men, 3 women and 6 children in the Iraqi village of Haditha. This past week, as Assange experienced his 420th day of house arrest without charge, a secret US military report was leaked to the BBC and The Times that “portrays the Taliban as being under the thumb of Pakistan’s powerful security agency, the Inter-Services Intelligence (ISI)”. Could this be the same Pakistan military so heavily funded and tooled up by the U.S. and U.K.? To whom is this contradiction a secret? Surely not the Pakistan military and the Taliban! Maybe a secret to the British and American parents who are sending their children to kill and die in what the U.S. and U.K. military elites recognise as a lost war in Afghanistan. 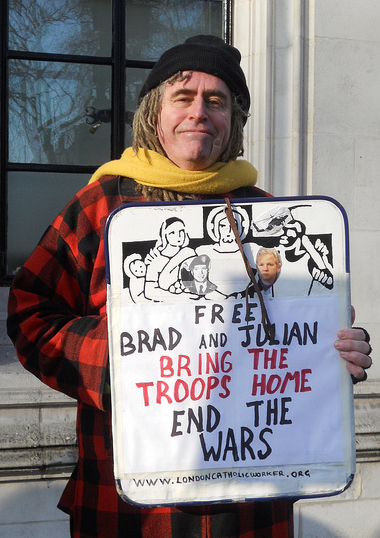 This past week we attended yet another of Julian’s court appearances in London. This time the setting was at the Supreme Court, where seven judges were to consider whether a Swedish prosecutor rates as a “judicial authority” in the ordering of an European Arrest Warrant. At Giuseppe Conlon House we rose around 6 a.m. to make our way into central London. Our house is named after an innnocent man who died in prison as a victim of a now recognised Miscarriage of Justice. At our Catholic Worker (CW) house we offer hospitality to destitute refugees, many who have fled wars in Iraq, Afghanistan, Africa and corrupt governments that WikiLeaks has been busy shining a light on. The police had initiated contact with us as the Supreme Court falls in the remit of the authoritarian SOCPA legislation that does its best to restrict demonstrations in the vicinity of British Parliament. The Supreme Court stands facing the Houses of Parliament. Our global crew on the tube included African, Australian, a British veteran of both Iraq and Afghan wars, North and South American. Roland and Sue arrived by cycle from South London with hot tea & coffee and dumpster dived treats. Other activsts began to arrive – one woman had flown in from Switzerland, a guy from Glasgow, a mother and daughter from Germany. Kiwi John cycled in with his guitar strapped to his back. He started playing and didn’t stop for two days. A crew from Occupy LondonSX at St. Paul’s added to our growing number. 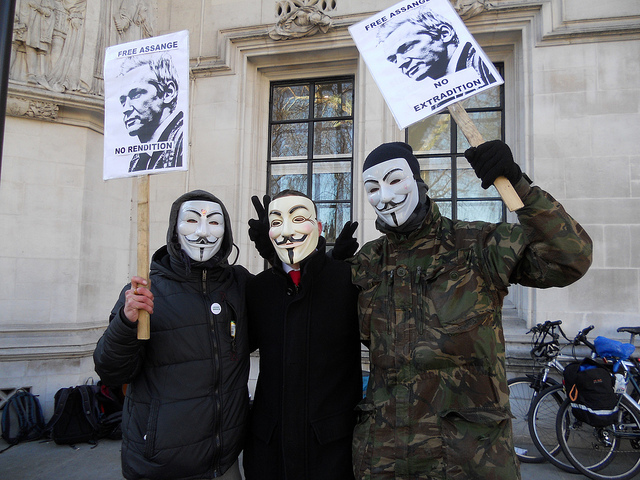 Anonymous folks in their V masks kept appearing. 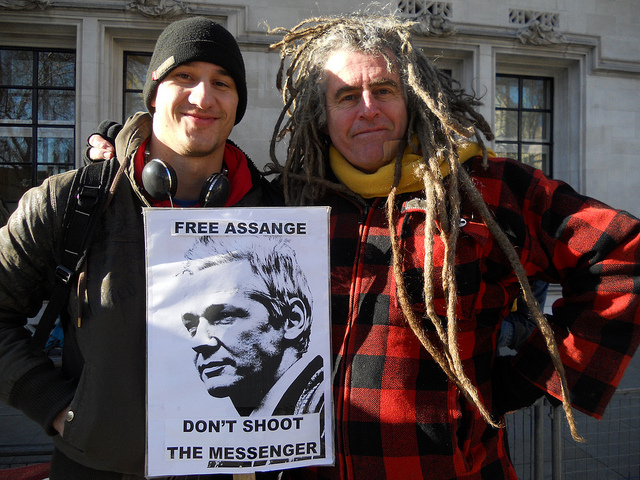 Gareth Peirce who once represented Giuseppe & Gerry Conlon, more recently folks in Guantanamo, ploughshares activists and now Julian Assange, walked into court. When you’re anywhere near a court, it’s reassuring to see Gareth arriving. Julian and WikiLeaks folks arrived about 9.30 a.m. The manic media scrum from the High Court days in November was not repeated in the morning due to the snappers being penned in behind police barriers. No need for us to run interference and time for Julian to greet and thank the support. John struck up Dylan’s “I Shall Be Released” and we all joined in as Julian entered court. Getting him out on the conclusion of the second day would be a little more hectic. We stood for two long days in vigil outside the Supreme Court as the temperature rarely went above 2 degrees with the wind chill taking it down another level or so. To “vigil” is “to stay awake” when governments want us sedated and silent as they carry out their death dealing on the extremities of empire and bury dissidents in their domestic dungeons. Folks took turns in going into the court building to view proceedings on an internal feed. So there on the pavement, surrounded by the powerful institutions of state and media that have for these long years facilitated the killing and dying in Iraq and Afghanistan, we built community and solidarity for those few days as one of our own ran the gauntlet for exposing their lies. What the future holds for Julian, Bradley and others in the crosshairs of empire is in our hands. It depends on what community, solidarity and nonviolent reisistance we can muster in these times. 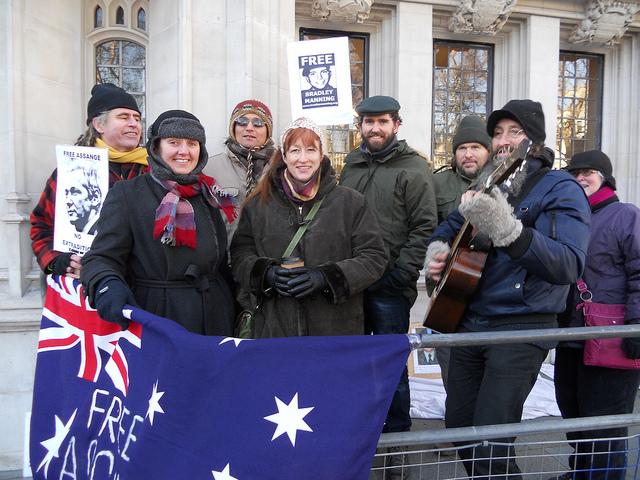 More photos from solidarity at the Supreme Court in IT Friends of Bradley Manning’s photostream. See also this article by John Pilger on Bradley Manning and Julian Assange, and this interview with Jennifer Robinson, legal adviser to Julian Assange and WikiLeaks. you are a great writer ciaron o’reilly!